In the early 20th century, the Shore Road coastline looked a little rawer than it does today. The present highway and promenade and even parts of the park were built atop landfill, in the 1930s and ’40s; a few decades earlier, some of Shore Road was active waterfront, with piers, fishing shacks and usable beaches. The Drive itself was popular, dotted with mansions, offering sea air, attractive vistas and pleasant surroundings to countryside amblers, vacationers from the city and hobbyist bicyclists. The spectacular plans, involving one shorefront road and another above, on the bluffs, didn’t quite come to pass, but the sentiment remains true. Today the park and winding road are defining features of our neighborhood, symbols of pride we offer up whenever some knockabout from up north asks what we have to offer. 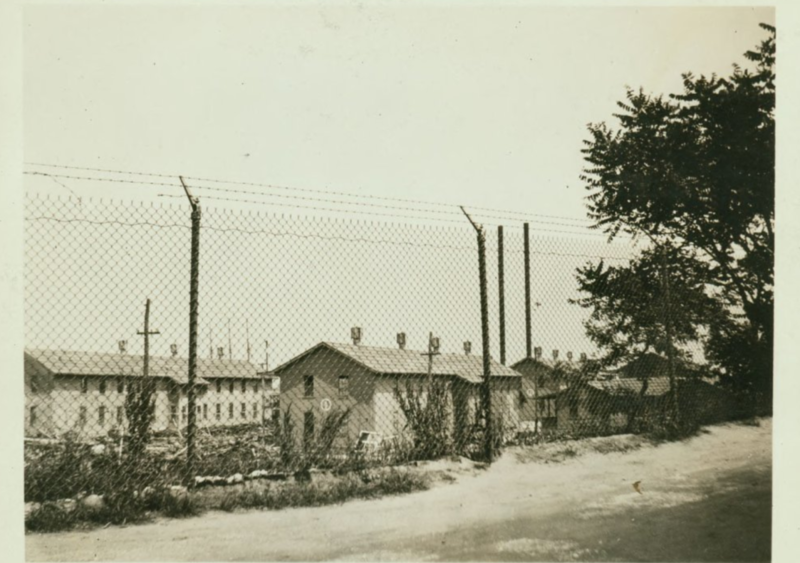 But the park almost didn’t come to be—it almost became a permanent military installation, which would have forever changed the character of this once bucolic town. 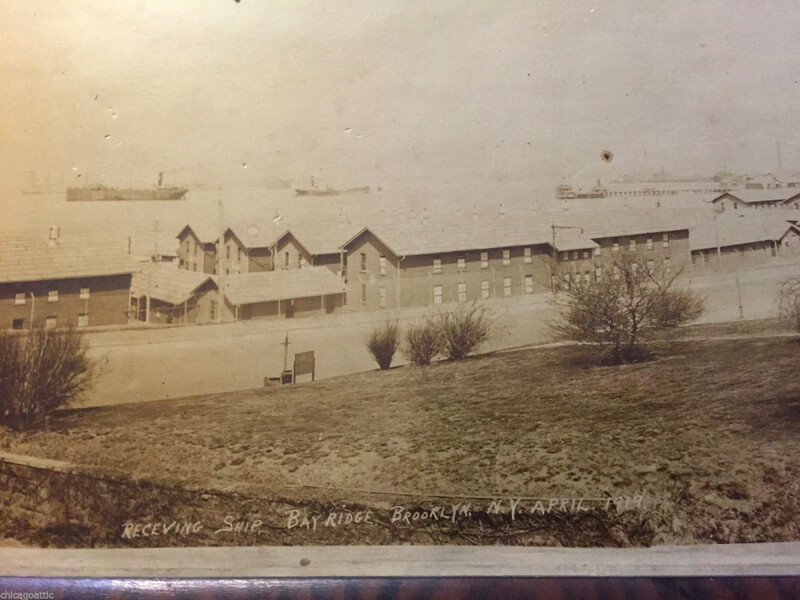 On July 20, 1918, a tiny item in the New York Sun reported that Post & McCord, a firm known for its ironworks, received a contract from the Navy to build barracks on Shore Road, from 69th Street to 86th Street—“more than 100 frame structures, north and south of the Crescent Athletic Club property [now Fort Hamilton High School]” for a cost of almost $1.4 million ($22 million, adjusted for inflation). 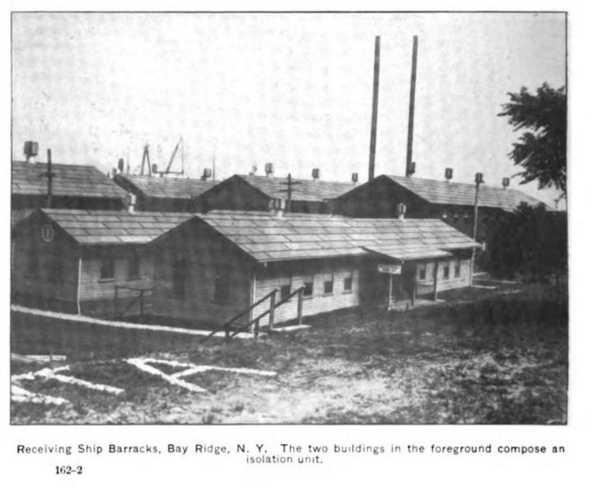 These original barracks occupied a mile of land, 32.5 acres, with 99 buildings, including 38 barracks (plus another two for quarantine), two barber shops, six latrines, a post office, a laundry, a laboratory and many other offices and administrative and maintenance buildings, according to the United States Naval Medical Bulletin of January 1920. 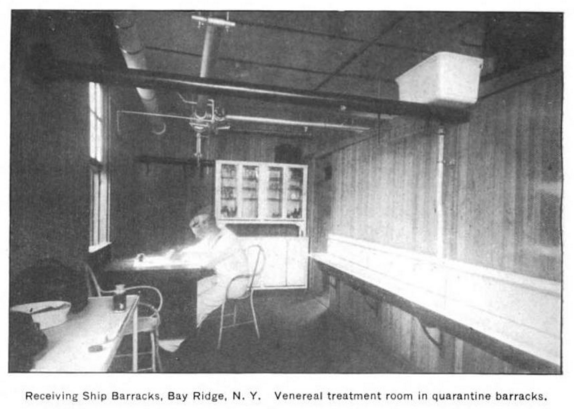 The barracks would service the receiving ship, which Webster defines as “a usually obsolete or unseaworthy ship moored at a navy yard and used for new recruits or men in transit between stations,” that had docked at the foot of 74th Street. 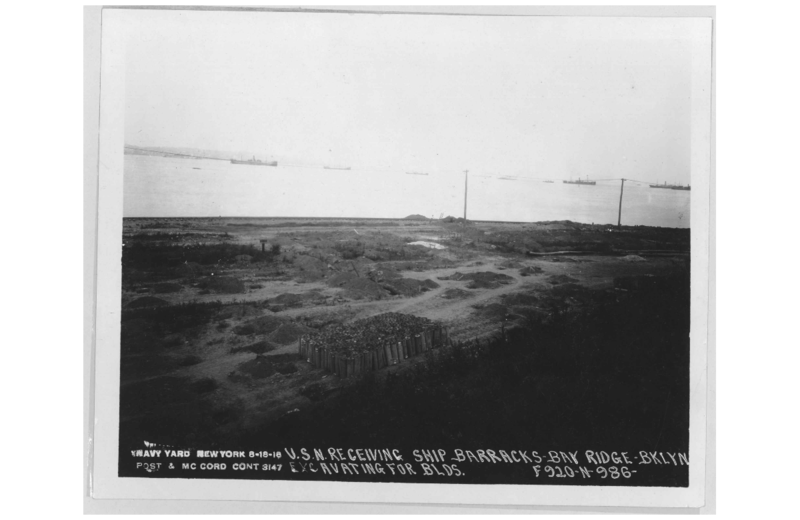 The US had entered World War I just a year before, and the city had agreed to hand over use of the shore for its duration. 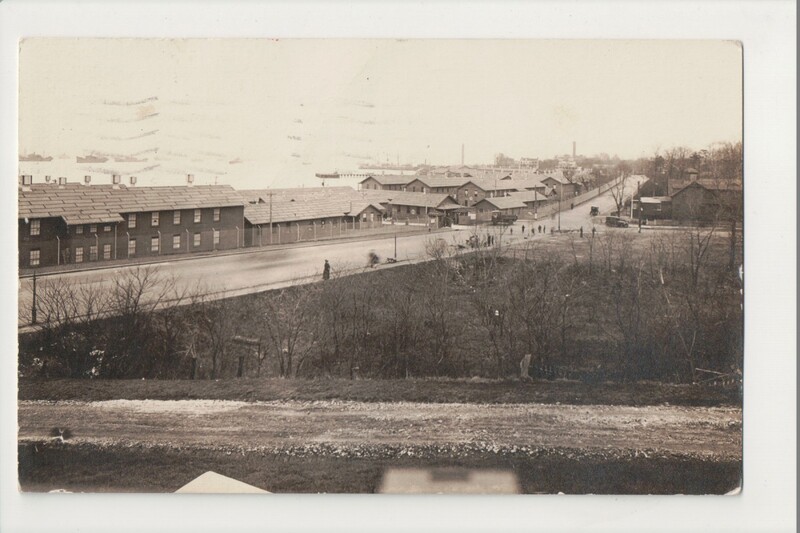 At the time the barracks were built, American soldiers were arriving every day in Europe by the thousands, giving the Allies the edge they so desperately needed. 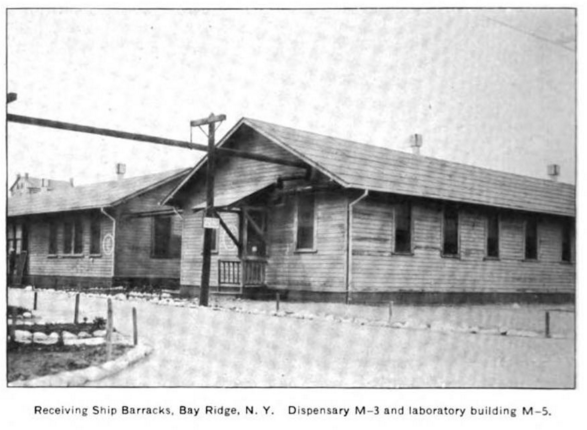 The Bay Ridge Chamber of Commerce, fearing that the series of buildings comprising the naval barracks along the Shore Road of Bay Ridge might become permanent or be permitted to remain intact indefinitely, has started a movement to have the buildings removed when vacated by the units at present occupying them. The chamber is backed in this movement by many property owners of the section. It was the understanding of the property holders in the section when the buildings were erected that they would be used only for the period of the war, but the continuation of work on uncompleted structures has given rise to the fear that the buildings may remain indefinitely. 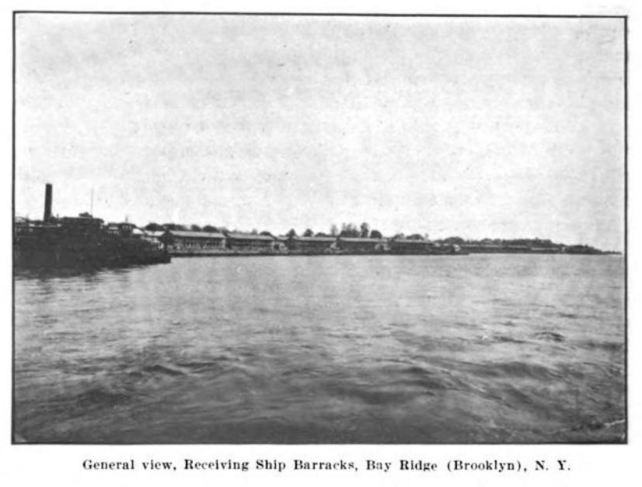 That section of Shore Road now occupied by the Navy Department is in control of the Park Department in normal times, and when the Government decided to use the strip of land, Park Commissioner John Harman had an understanding with the Navy Department that the parkway would be turned back to Brooklyn in the same condition in which it was taken. It was also agreed that any improvement installed by the Government would remain if, in the commissioner’s judgment, the parkway would be benefited thereby. 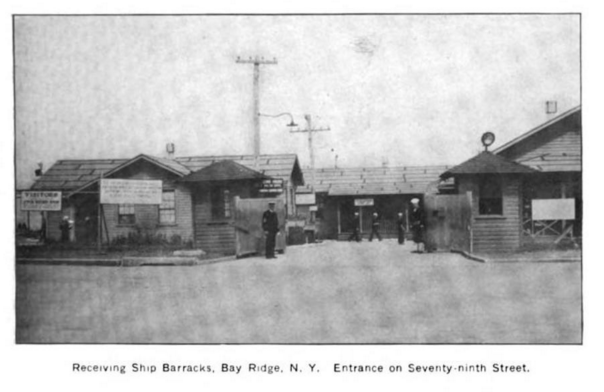 In March 1919, the Navy had said the barracks would stay at least until the fall, disappointing local residents; the Eagle used words like “eyesore” and “unsightly.” “The protest of the people of Bay Ridge against the occupation of the Shore Road by the Navy Department is a just one,” wrote one citizen. “The whole of the driveway is marred by the shacks and smokestacks. How long would the residents of Riverside Drive permit this?” But, after all, though fighting had stopped, the demobilization process took time. 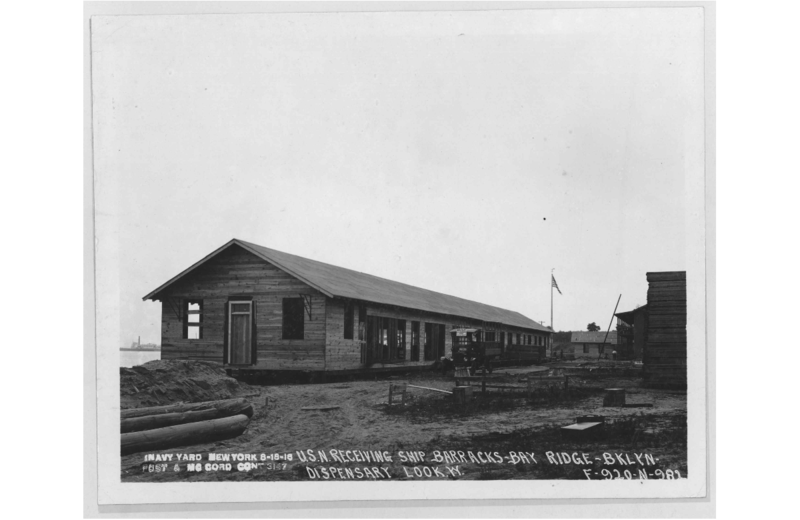 “The new cantonment was not finished in time to of much use as a receiving ship during the period of hostilities,” according to a report by the US Bureau of Yards and Docks. “However, it was particularly valuable during the demobilization period,” when the report says 182,000 people passed through the port, sometimes as many as 1,300 in one day. 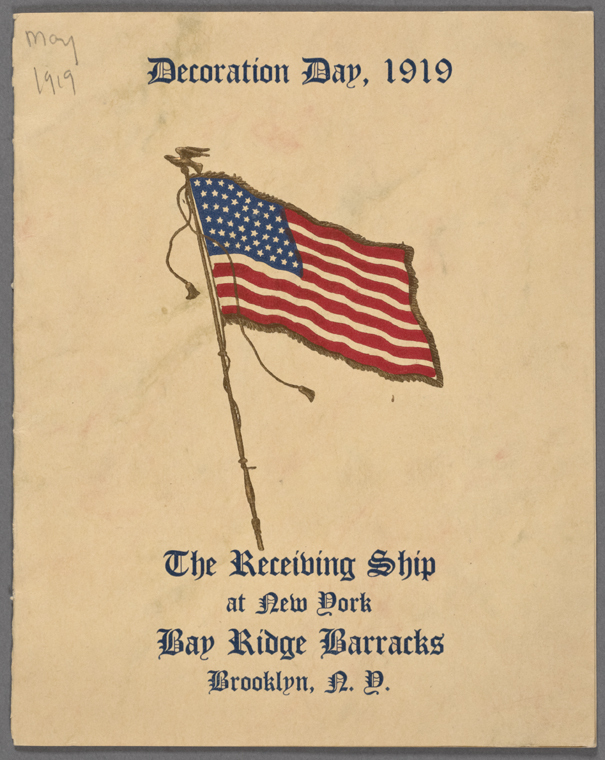 In May 1919, on Decoration Day (the precursor to “Memorial Day”), the Receiving Ship celebrated with music by The Receiving Ship Orchestras and Band and many sporting events: baseball games, track meets, boxing bouts—even a lacrosse match. The extensive menu included “crisp crackers” for the tomato soup and, along with black coffee, cigars and cigarettes. A similar celebration was held on Independence Day. 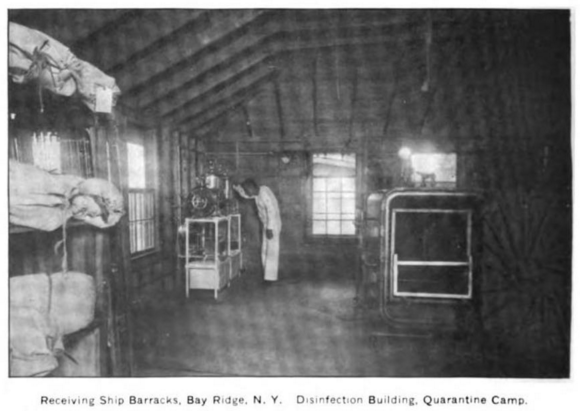 We suffered the smell of cooking all through the war from these buildings and did not complain. We are willing to sacrifice as we all had to do in the common interest…My taxes have increased from $30,000 to $47,000 [$423,000 to $663,000, adjusted for inflation] last year for my home that I mention, and with these buildings in front of it I do not believe that I could get half of that money for it…I am asking no particular favors but do not think I am deserving of any particular punishment. 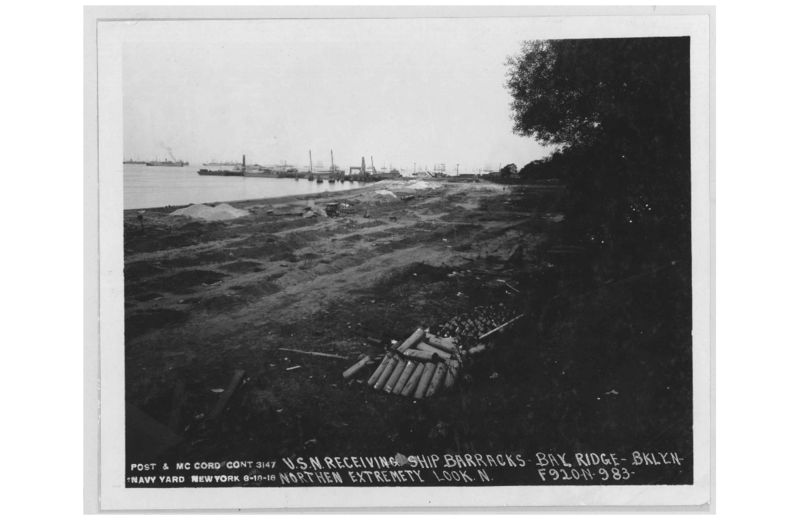 “The Navy Department…has apparently not been very anxious to remove the Receiving Ship, and it is known that an attempt has been made to allow the barracks to remain along the Shore rd. for all time,” the Eagle reported. 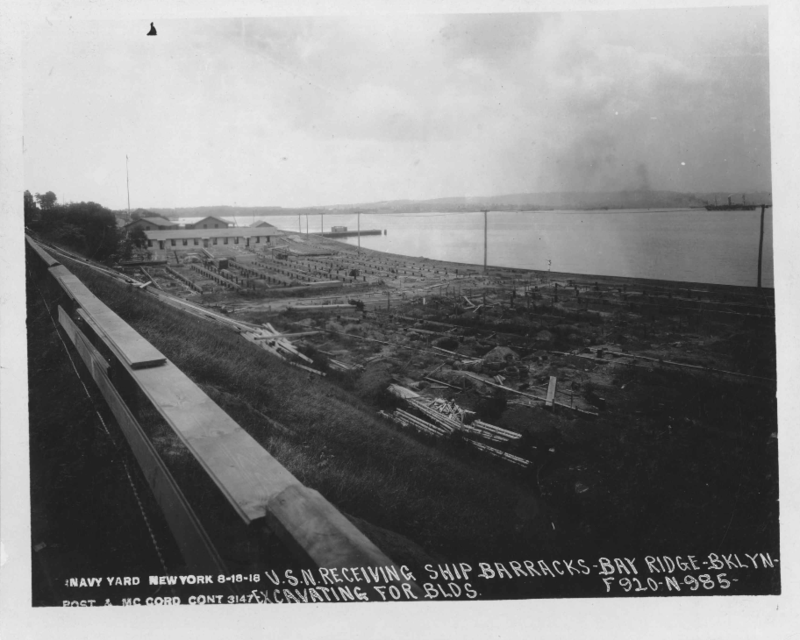 This would have created a military installation that stretched from Fort Hamilton to the Brooklyn Army Terminal, two miles or more of fortifications, docks, sleeping quarters and more, a massive Army–Navy complex. But the parks department opposed this, not in small part because $3.5 million (almost $48 million, adjusted for inflation) had already been spent on improvements—development that would continue when the Navy tore down its little community (which had cost it more than $1 million, or more than $13 million, adjusted for inflation). Bay Ridge’s local leaders also opposed permanent barracks, not in small part because of the effect it would have on property values (and, uh, the beauty of the natural landscape!). But contentions continued, creating a rift between locals and the military. 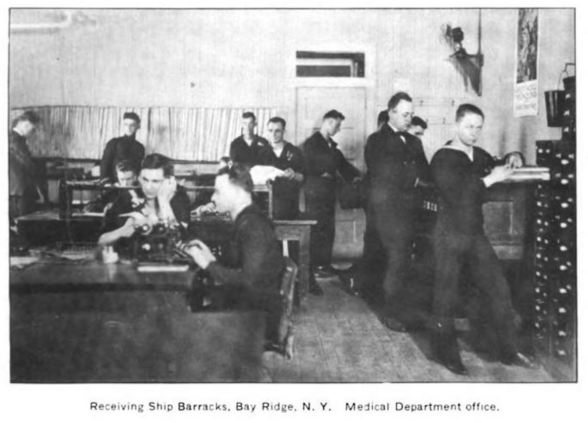 “The small Navy clique of officers who would foist the Shore road barracks permanently on the people of Brooklyn have taken a new tack. 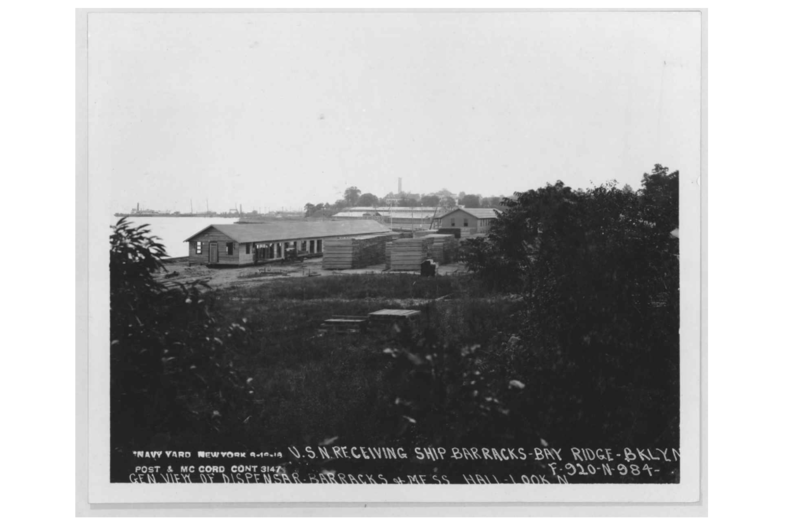 The benighted Bay Ridge citizens who want their park back are told to ‘get out from behind their Chinese wall’ and realize what a boon the barracks are to the section,” the president of the Bay Ridge Chamber of Commerce, Stephen V. Duffy, wrote to the Eagle in the spring of 1920. One of our foremost civic workers, whose two sons were volunteers in the service, is called a Bolshevik when he protests against the usurpation of our property…The war is over and we want our Shore Road Drive back. It cost the city $5,000,000, is dedicated to park purposes, and should not be otherwise occupied a minute longer than is necessary. 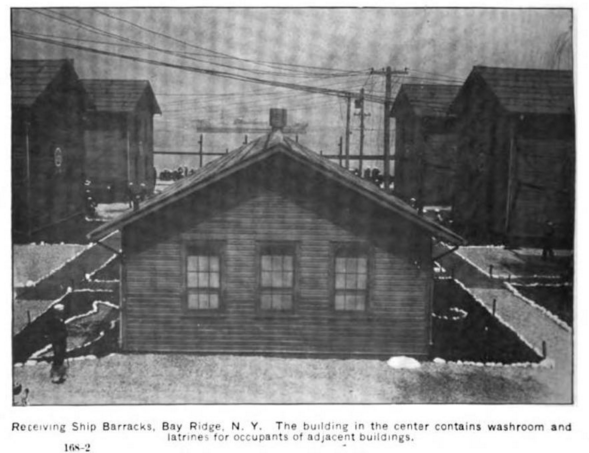 These crude wooden barracks are as much out of place on Brooklyn’s Shore Road Drive as they would be on New York’s Riverside Drive. 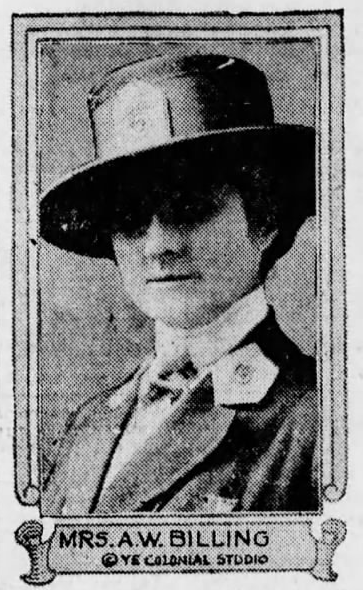 This letter followed a meeting at the Bay Ridge Theater, earlier in the month, at which the rival factions had fought. 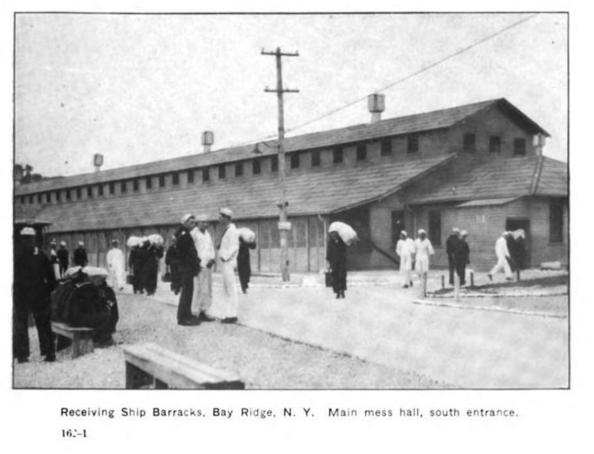 The Navy had said the barracks would remain another two years, before a new home “at least as convenient to the Navy Yard” could be built. 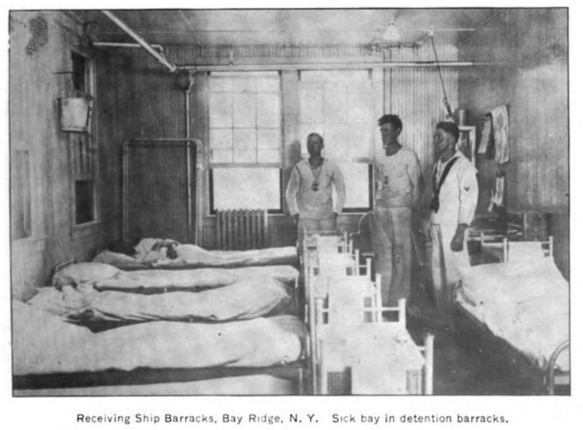 Also, the Navy had warned “that the enemies of the barracks had best pick their steps carefully, since the city Tenement House Department was interested in the buildings and might take them over if the Navy got out,” the Eagle reported. 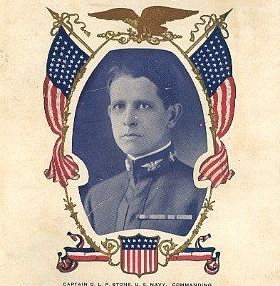 The Navy was talking about Fiorello LaGuardia, then president of the Aldermen (like a modern-day City Council Speaker), who thought the barracks should house families “until the end of the present housing famine.” But a committee decided the buildings couldn’t be occupied without “extensive alterations, and that the cost of such alterations was prohibitive,” the Eagle reported. 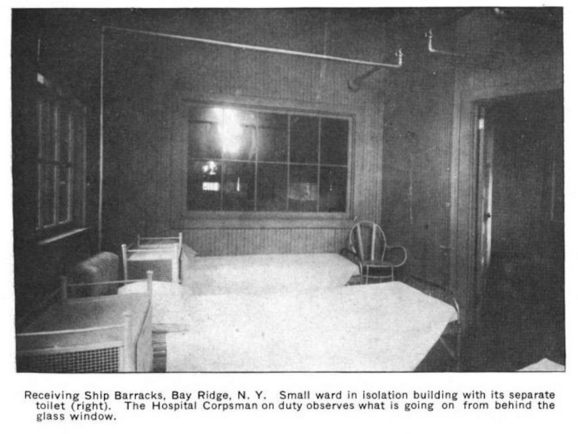 But you know that Bay Ridge prevailed—Shore Road did not become permanent barracks, nor did it become a waterfront tenement community, thanks to the leadership efforts of Stephen Duffy, to whom we owe a great deal of thanks for our present-day park. (He lived on Second Avenue between 74th and 75th streets, which is where Mrs. Billing also lived; their involvement in the issue makes sense, given that they both lived just up the block from the receiving ship itself.) 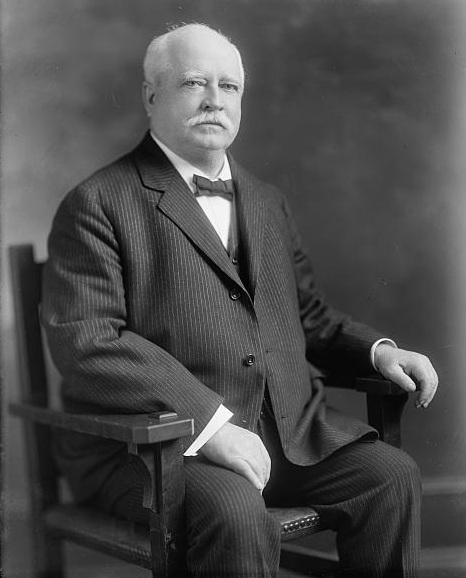 His chief antagonist was Captain G. L. P. Stone. 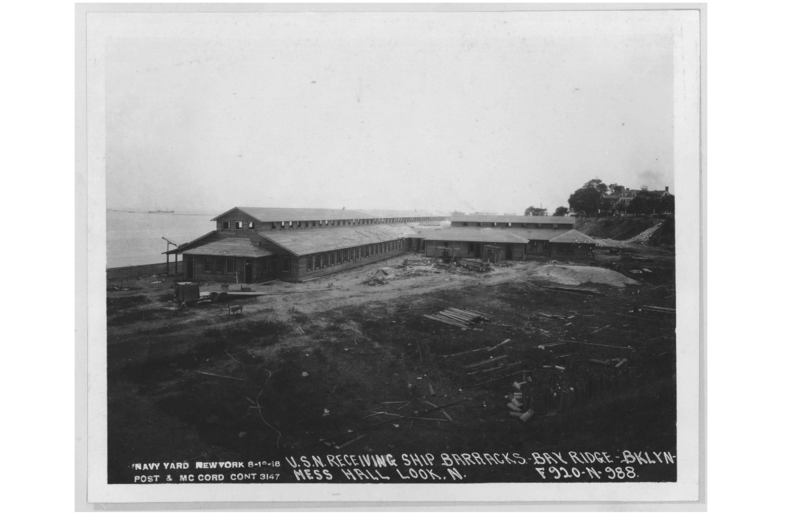 On May 21, 1921, a year after the contentious meeting, the Navy gifted the $3.5 million barracks to Brooklyn’s department of parks, with an agreement to vacate no later than June 15, approved by Assistant Secretary of the Navy Theodore Roosevelt III (the late president’s son). In return, the Navy would no longer have to return the land that way it had found it. Harman’s plan is basically how Shore Road turned out—but his plan wasn’t implemented overnight. 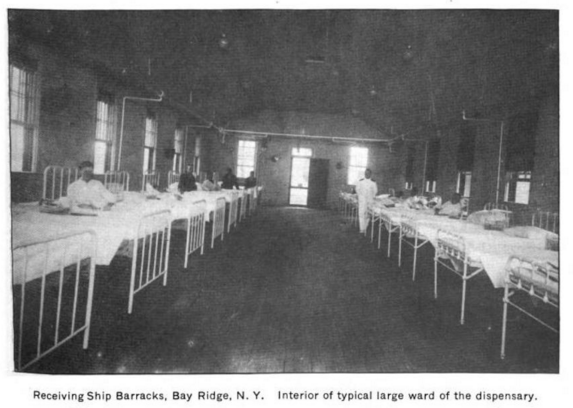 By January 1922, Harman had to be ordered to clear the buildings, which were still standing. 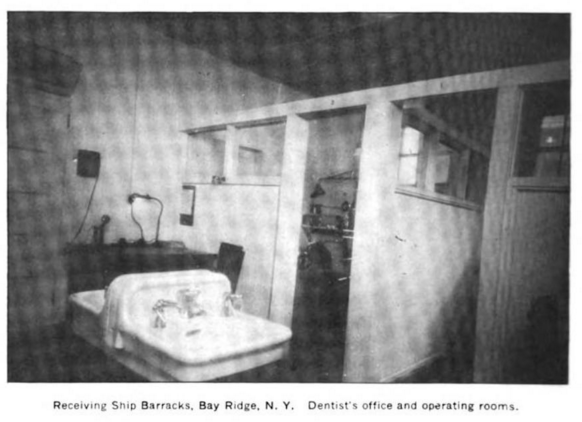 In September, the barracks were mentioned in a classified ad in the Eagle—as the address of a place to buy firewood. 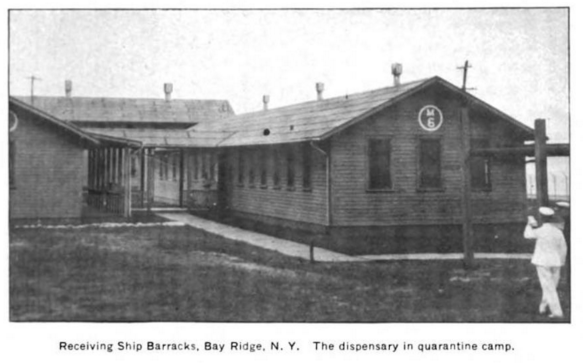 Just a few years after the barracks had been cleared, on June 4, 1925, the Brooklyn Eagle published a letter from a disgruntled resident. 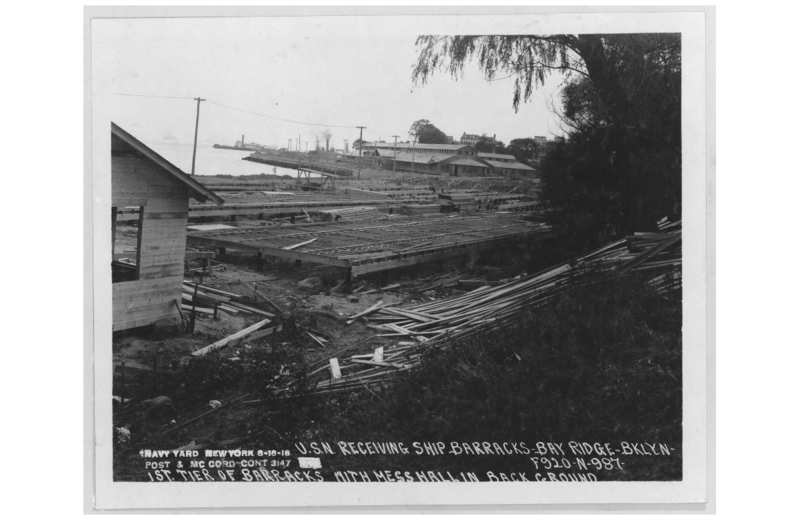 Shortly after the war, when the unsightly barracks of the Navy were removed, great things were promised for the future of that driveway and its environs. Aside, however, from an attempt to widen the roadway in spots, everything seems to be just as it was before. 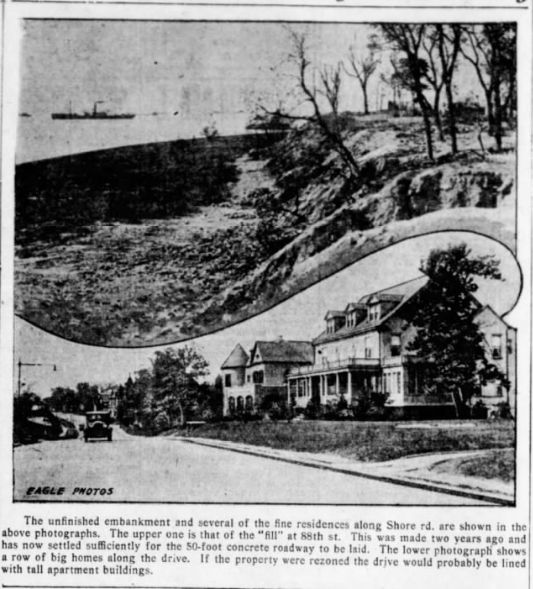 In 1927, the Eagle said [Shore Road] had been “neglected for years,” and described its “dilapidated houses, a few mansions, many vacant lots and an ancient narrow motor road.” New plans called for a 50-foot drive fringed with parkland to create…“a shore front and a shore drive which will challenge in scenic beauty that of any similar driveway in this country”—specifically Riverside Drive, in Manhattan. 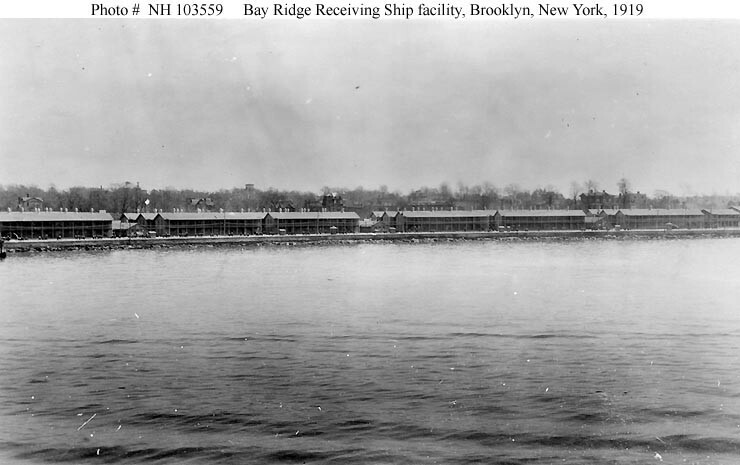 The wealthy had stopped moving to Bay Ridge as [often as] they had in the late 19th century, and to make the land available to people of more modest means, [it was] suggested changing the zoning, so apartment buildings as high as 15 floors could be built. Such private property would abut eight-foot sidewalks, then the 50-foot road (five lanes! ), then park space to separate the road from a 12-foot “tiled walk,” then a railing and some trees and shrubs along the sea wall. The development of these parks was tied directly to the construction of apartment buildings, or so said [the plan’s advocates], who said property values would soar and bring with them higher tax revenues. That’s not quite how it turned out, but it’s close. Plans for the Shore Road became folded into Robert Moses’s plans for his Circumferential Parkway, later renamed the Belt, construction on which began in the 1930s. It turned out that the worst parts of present-day Shore Road—the apartment buildings, the highway—are really what made the best part possible: the miles of public parks. I’d take the Belt Parkway over miles of military base any day—as long as it meant I could have the park, too.